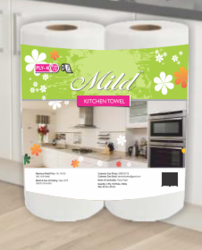 We are instrumental in offering Toilet Rolls which is appreciated for their durability and high absorbent properties. These rolls encompass a unique ability to enable reduction in continuous replacement in heavy traffic restrooms. Our professionals ensure that these products are thoroughly tested for their quality before these get delivered to the clients. The range is offered in various specifications to meet the requirements of the clients. Incorporated in the year 1986 at Delhi (India), we, “Myra Foils”, have gained recognition as the leading manufacturer and exporter of impeccable quality range of Tobacco Foils, Blister Foils, Chocolate Foils, Firework Foils, Household Foils, Food Wrapper, Alu Alu Foils and Aluminium Circle. These products are precisely manufactured under the supervision of our experts using excellent quality aluminum and innovative technology in compliance with the international quality standards. The offered products are widely acknowledged among our clients for oxidant resistance, water proof, moisture proof, ability to bear heat and moisture absorption. We offer our product range to our clients after stringently testing it on various quality parameters to ensure flawlessness. Moreover, the offered product range is available in various sizes, dimensions, custom options and counts of thickness at reasonable prices.